I have been suffering from a bout of the blues lately. This often happens to me around Thanksgiving, as I get my house and kitchen ready and begin preparing the family meal. It makes me think of Thanksgivings past and then I start missing old friends and beloved family who are no longer with us, either through distance or death. And then I get blue. It just happens. It’s a Thanksgiving appetizer – one I would very much like to do without. And the news doesn’t help. Doom and gloom, doom and gloom. Many people have lost money, homes, jobs and more. So today, as I was preparing the cornbread stuffing and the mushroom stuffing, I tried to concentrate not on what I don’t have, but on what I have – what I am grateful for. 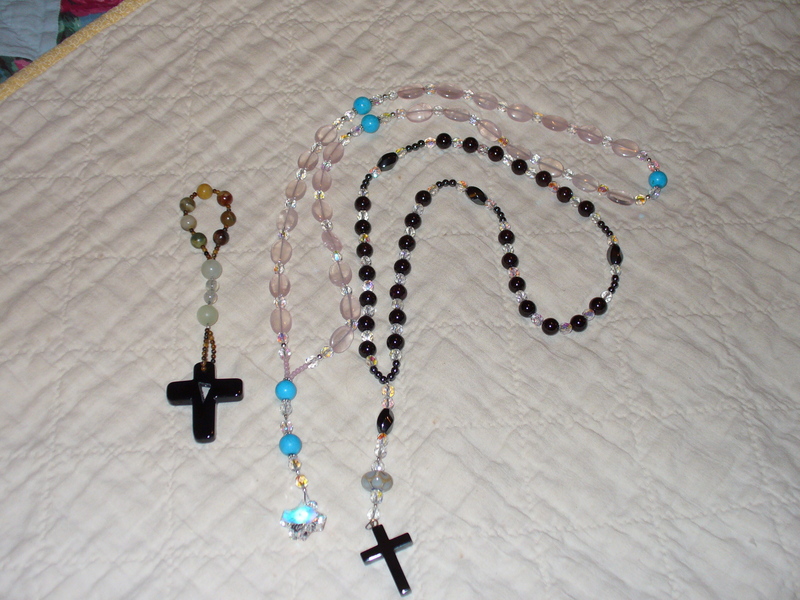 Here, in the form of prayer for an Anglican and a Catholic rosary, is what I came up with. I’ll site my sources at the end. God our creator, you have created me in every part. Bless me through and through that I may delight to serve you to the full. 1 – I thank you for my eyes, that I may discern the beauty you give. 3 – I thank you for my sense of smell, that your fragrance may fill my being. 4 – I thank you for my lips, that I may speak your truth and sing your joy. 5 – I thank you for my hands, that they may play, write and touch as you guide them. 6 – I thank you for my feet, that they may be messengers of your peace. 7 – I thank you for my imagination, that I may be fired with wonder in your truth. 8 – I thank you for my heart, that I may be filled with your love. 9 -I thank you for the love you make me feel, that I may share it with others. 10 – I thank you through and through, that I may delight to serve you to the full. 1 – I thank you for my family, who uphold me in times both good and bad. 2 – I thank you for my friends, who keep me honest. 3 – I thank you for my animal companions, who remind me of your unconditional love. 4 – I thank you for my home, which gives me an anchor in the world. 5 – I thank you for my mind, which helps me earn a living. 6 – I thank you for my talents, which give me joy and meaning. 7 – I thank you for my health, through which I enjoy all else I have. 8 – I thank you for my life, which because of you has meaning. 9 – I thank you for your love, which is the greatest gift you give. 10 – I thank you for the food I will eat today, which enables me to know and enjoy all these things. Sources – The prayer for the cross is an old Celtic prayer; the prayer for the Firth Three Hail Mary Beads is from a Celtic prayerbook by David Adam; the prayer for the First and Third (and Fifth) sets of beads were adapted from the Episcopal Prayer Book for Australia; I wrote the prayers for the Second and Fourth sets. Guess what? This blog is one year old today. YEAH! Happy Birthday! 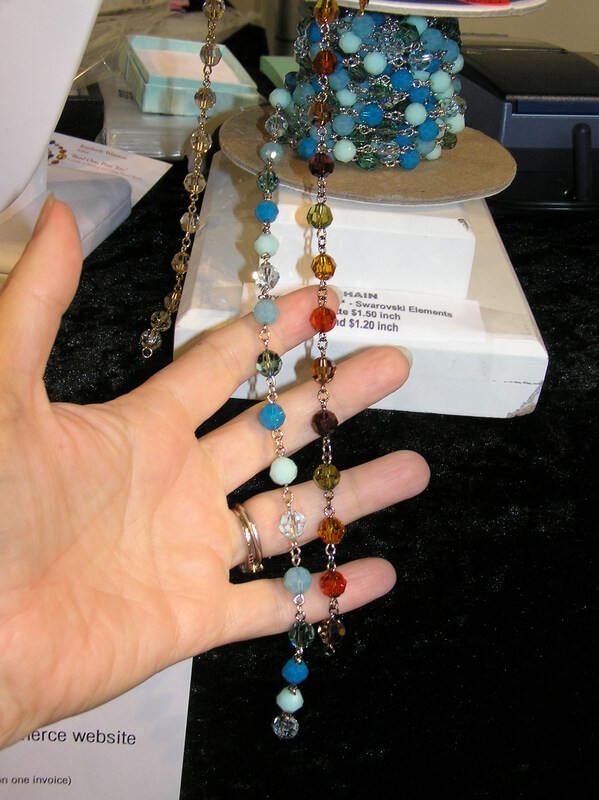 In honor of this day, I am blogging about a recent trip I made . . . .
Last Saturday, my good friend Lisa Beaudo, a jewelry designer, and I went to the Bay Area Bead Extravaganza, otherwise known as the BABE Show. BABE is held each spring and autumn in the Oakland (Calif.) Convention Center and bills itself as the second largest bead show in the US. After last spring’s show, I wrote an entry on new and unusual terminal charms I saw there. This time, I was on the hunt for good, different and unusual beads that would make great cruciform beads (for Anglican rosaries) or Our Father beads (for Catholic rosaries). Most of these could also be used for a set of Pearls of Life. We got to the show just at the start, 10 a.m. 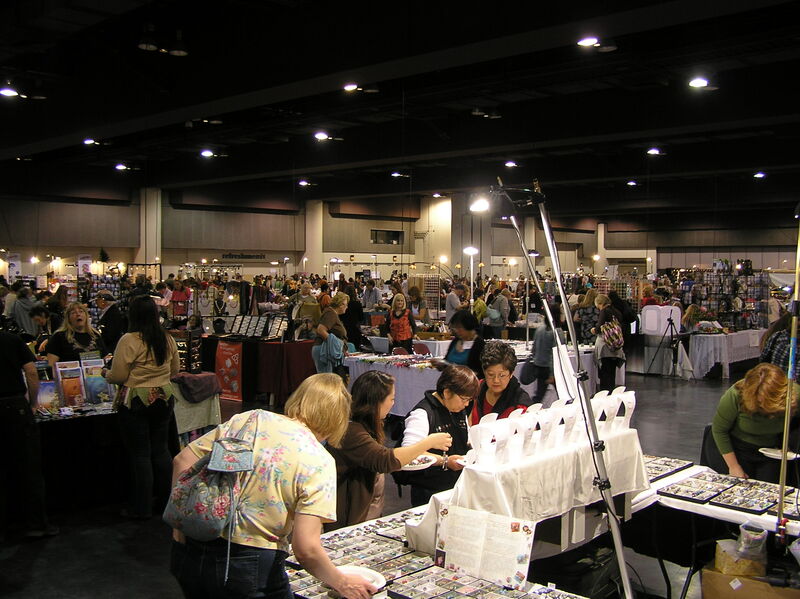 Immediately upon walking in, we were just overwhelmed at the size of the show – bead booths from wall to wall. 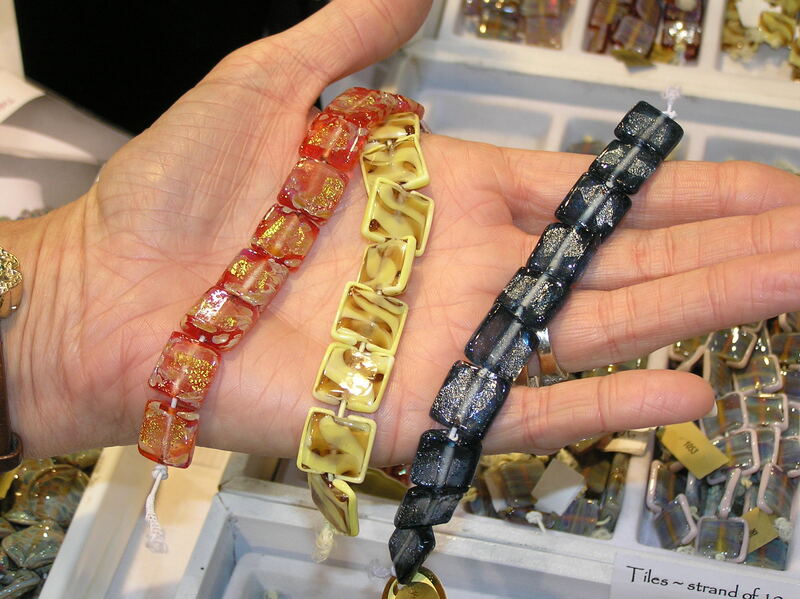 There were bead artists, jewelry designers, suppliers, teachers – you name it, it was there. There were tons of beads – way more than I could ever photograph or write about – so this is just a personal selection – things I would like to buy or use for prayer beads. If you’d like to see more, visit the BABE website and link to the websites of the different vendors. 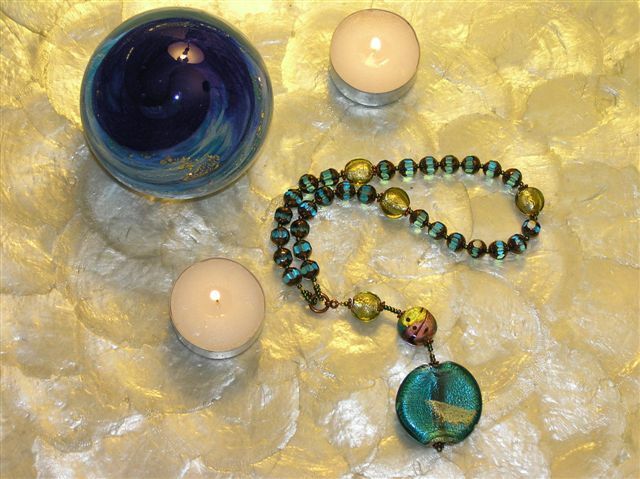 Scorpio Beads features the handmade beads of Nanette Young-Greiner. Her Harlequin and Watercolor Stripes beads are beautiful and affordable. Think of matching them with 6mm Czech glass. YUM. Also really cool are the handmade polymer clay beads from Bead Ranch. Mother-and-daughter team Susan Terry and Gina Senzatimore create beads of all sizes and shapes – hearts, globes, diamonds, etc – using the millefiore technique of Italian beadmakers. I own a bunch of these beads – I buy a couple every bead show – and am just waiting till I hit critical mass to make something from them. Their website leaves a lot to be desired – one stinking picture! But maybe if you call them, they can help you out. 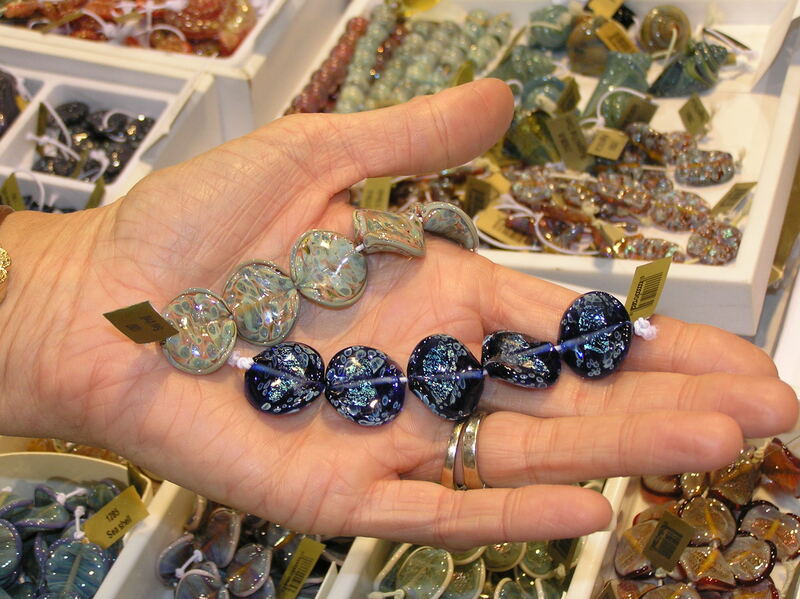 In the Alacarte Clasps booth, I saw a Swarovski product that would make rosary making a snap – if somewhat pricey. Alacarte – owned by Linda and Tim Hartung of Santa Rosa, Calif.- has strands of 8mm round Swarovski crystals already joined with chain for $1.20 per inch, with a 6-inch minimum. Now, I know this is somewhat pricey, but if you really want a chain-linked rosary and don’t know how to make one or don’t want to part with the time required to make one, this would make a great option. 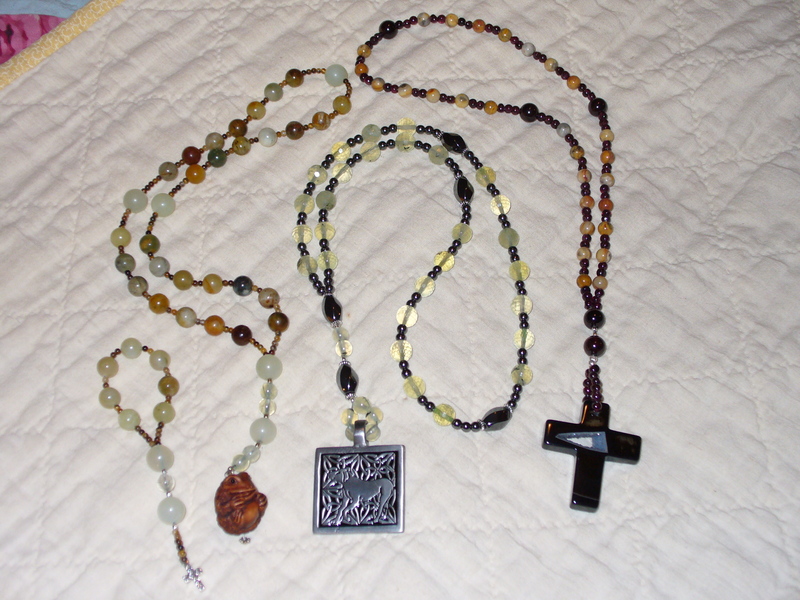 Just add the few remaining necessary beads – an invitatory bead and four cruciforms for an Anglican rosary, 5 Our Father beads and a medal for a Catholic rosary – and terminal charm of your choice and you’re done! It was a great show. We visited EVERY booth and got out of there about 30 minutes before the show shut down 6 p.m. Then we came home and rolled around in our goodies! Nah – just kidding.